The last article that listed extensions and themes of my personal Firefox installation dates back a while, and I thought it would be nice to post an updated list of my personal setup. This setup works well for me but I don't think it is the ultimate one. To be honest, I do not think that there is a perfect setup for Firefox. It highly depends on what you do on the Internet. A webmaster or web designer will make use of different add-ons than someone who is interested in social networking sites like Facebook, shopping or extreme security. I make use of core add-ons that are installed all the time and temporary add-ons that I only install when I need them. One example of temporary add-ons is the excellent web development add-on Firebug (Update: The integration of Web Developer Tools in Firefox has made this superfluous). I also have to say that I'm running the latest version of Firefox 3.6 and not the latest stable version of Firefox 3.5x. Many of the add-ons had to be forced to be compatible with the Nightly Tester Tools add-on. They do work perfectly though afterwards. Note: Some of the extensions are no longer compatible with recent versions of the Firefox web browser. I have removed links if there is no alternative, or added links to alternative extensions that work in those newer versions and replicate most or all of the add-on's functionality. App Tabs - I reviewed the add-on yesterday and really like it. Tabs can be pinned and minimized on the left side of the Firefox tabbar. This is great for websites and services that are open all the time. Bug489729 - This prevents Firefox from opening a new window if a tab gets dragged accidentally in the web browser. Some users do not have a problem with this at all while others have to cope with this behavior regularly. 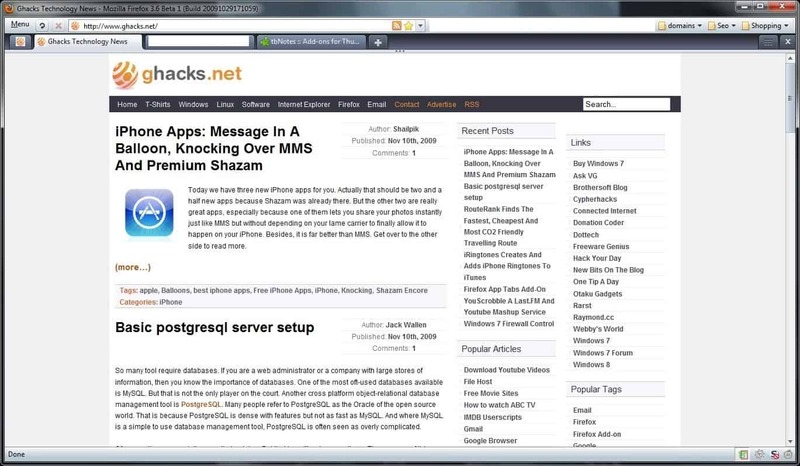 Greasemonkey - Userscripts can be very useful in many occasions. There are some great ones out there that really improve the web surfing experience. Last Pass - I switched to Last Pass after using the build in Firefox password manager for a long time. Last Pass offers a lot of additional features including a secure password generator, form profile manager to automatically fill web forms, automatically log into websites, web access to all passwords. Multi Links - If you regularly work on websites where lots of links are posted that you all need or want to open then Multi Links is for you. You can draw a rectangle around an area on the website. Every link in that rectangle will be opened once the user lets go of the right mouse button. Excellent for forums, link lists or blog posts. Nightly Tester Tools - Most add-ons have not been updated by their developers yet to be compatible with the Firefox 3.6x branch. This tool makes them compatible with this version. It will be uninstalled once all developers have updated their add-ons. No Redirect - If you hate being redirected by your ISP to a search page whenever you mistype an url then this is for your. NoScript - One of the two Firefox add-ons that I consider most important (the other is Last Pass). No Script will block all scripts from being executed on a website on the first visit. This increases the security of the web browser and computer system as most exploits and attacks make use of scripts to do so. SeoQuake - Useful for webmasters. SeoQuake can display various SEO related information about websites including their Pagerank, links, Alexa rank and more. Tiny Menu - I like the Firefox header to be as small as possible so that the actual website makes use of most of the screen estate in the web browser. Tiny Men compresses the menu into one menu entry which can then be merged with the address bar so that only one bar is shown at the top of the web browser. Operetta Theme - I ran the default Firefox theme for most of the time. But then I discovered the Operetta theme which brings the design of Opera 10 to Firefox. It looks fabulous but only works with Firefox 3.6x versions. And that's it. Not a lot of add-ons if you consider that some Ghacks readers use 70+ add-ons. The article lists browser extensions for the Firefox web browser that I make use of regularly in the browser, and recommended wholeheartedly. My setup is very minimal as you can see, I removed everything that is not necessary like the google search bar or the bookmarks toolbar. It only remains two line containing the menu, some icons the (long!) address bar. – Greasemonkey: do I need to explain? I know, my addons’ selection is not very minimal and contains some that could be avoided but each one is needed at some point. I’d be happy to know what you think. Nice setup Mums. One of the greatest things about Firefox is in my opinion the option to customize the web browser to your liking. I personally prefer NoScript over Adblock Plus as I think that the former is more powerful and adds more to overall security. Does NoScript block ads as well as AdblockPlus do? Yep I use Opera aswell. No need for addons to make it a secure and workable browser. Hum… well, I once had 78 extensions when I decided to clean-up: removed 3, then added 1: ouf! Seriously, on those 76 extensions (running Firefox 3.5.5) not one I consider useless! I just love’em :) Moreover, doesn’t slow down anything. Perhaps pulls up the CPU cycles a bit. You may want to look at Compact Menu 2. Works like Tiny Menu but you don’t have to move everything else up to the menu bar. You can move the menu to the toolbar or the bookmarks bar instead. and if you use any about:config customisations. How did you get that need list of all installed things? Martin: How can you use Firefox w/o Tab Mix Plus? Mouse wheel scroll to switch tabs, switching to last open tab when closing a tab, double clicking on a tab to close it etc…are very useful.